Modified version of the factory hook object, unhook on rising edge, useful for demuxing from single pot control etc. hahaha your beatmachine is very cool!!! Thank you!! The beatmachine is brilliant. =) Thanks for sharing the patch! The hookmod object is awesome but if the dial is left at zero and unhooked it will become frozen. I like zero. It is my friend. I would hate to have to avoid it. I've been quite busy lately but I will take a look at my shonky logic in the object when I can, it was just a dirty hack of a factory object. Thank you so much. I want to pepper this object all over a patch and most knobs would be at zero. Sync libraries, should be fixed. both of them have no patches in the community library to share, so you don't see them in that menu. double click on an empty space in a patcher to open the object chooser and search for hc or gav there, you should have more luck. EDIT: i find hc stuff there, but no luck for gav, so not sure he has anything published really (or it has been deleted somehow??) also GitHub seems to be down at the moment, so i cannot check there either. Yup, I only have objects in the library with attached help patches. Thanks @lokki, I did download gav's objects & patches from his post & put them into my private library but expected them to show up in the community library eventually. Guess the lesson here is to grab stuff (like I did) when you see it 'cause not everyone will use github to share with. As to 'hc,' I do see the objects. So I guess I'm doing the syncs right after all, lol. Sorry, but there is something wrong with my contributions, don't know why they weren't ending up on the library. Plan on looking into it this weekend. I see you were able to download from the post, is there anything I can assist you with ? 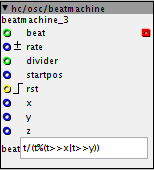 I got an error when trying to compile a patch containing a beatmachine object in 1.0.12. Some others pointed out that you must have an equation set in the "beat" field. From a user standpoint this is a little frustrating - as I didn't understand the console errors until after I had posted the error and had others explain it. From a developer perspective - if it were me - I would have a default algorithm set for the user to have immediate usability. I look forward to playing with it now that I know how to set it up. Unfortunately there is no way of pre-populating an object attribute within the object setup currently that I know of. That's why I provide hints in both the object description and the included help patch. Not ideal but that's my perspective.